Under Drains and Abutment Drains - SPI's Dual Wall HDPE pipe is widely used for highway under drains. It's consistent durability and easy installation make it a favorite for DOT's and consulting engineers. 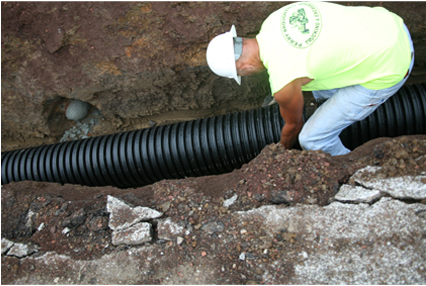 Storm Drains - Our Dual Wall HDPE can be installed 2 times faster than concrete. With a high weight to strength ratio, excellent hydraulics and corrosion resistance, it is the obvious choice to provide drainage for ground water and rainwater from parking lots, city streets, sidewalks, roofs and more. Roadway Culverts - Avoid the need to replace culverts in 10 to 20 years. Our Dual Wall HDPE pipe is highly inert and resists rust and corrosion, thereby preventing failure and the need for replacement earlier than necessary as is common with other materials. 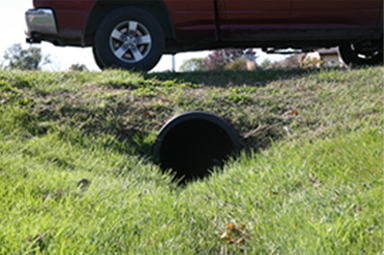 Springfield Plastics, Inc.'s drainage pipe has been protecting our highways and roads from the effects of saturated roadbeds and standing water in ditches for many years. Thanks to the durability and reliability of our pipe, it is the natural choice for highway contractors and transportation departments. Our corrugated dual wall pipe is a proven, cost-effective, reliable and successful solution for long-term drainage applications. Service Life: HDPE pipe has been produced for 40+ years and has an excellent performance track record in drainage applications. Springfield Plastics, Inc. has been producing single wall pipe for 35+ years and dual wall pipe for 26+ years with countless installations still functioning at optimum performance. HDPE Pipe manufactured today meets or exceeds the criteria set forth by AASHTO to have a service life exceeding 100 years. Structural Design: Lightweight with an extremely high strength-to-weight ratio with a variety of lengths. This allows for smaller work crews and less heavy machinery all while maintaining the utmost quality and structural strength. Corrosion Resistance: Highly inert and resistant to rust and corrosion. Resists biological growth by bacteria and fungi, as well. Has a high chemical resistance so, unlike steel and metal pipes, it is ideal for harsh chemical environments. Watertight Joints: Unlike concrete joints that can have manufacturing flaws or flaws caused during the unloading movement-process that are difficult to fix once at the site and can be hard to assemble in cold temperatures, the joints on HDPE pipe create a leak-free, self-resistant structure. Our pipe is specially designed to create a precise fit and a completely sealed joint from one piece of pipe to the next. The nature of the pipe's design allows for quick and efficient installation with a minimal number of workers, all while ensuring a completely sealed joint every time. Structural Characteristics: Made of materials just a fraction of the density of steel, HDPE pipe is lightweight, and liners and coatings are unnecessary as it is resistant to abrasion, unlike other materials. 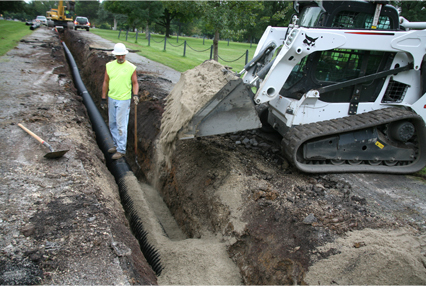 Due to its unique characteristics, HDPE can withstand high traffic areas with low burial depth. Its strength also contributes to its effectiveness in earthquake-prone areas. HDPE pipe and fittings are inherently tough, resilient and resistant to damage caused by external loads and vibrations. It preserves excellent hydraulic characteristics throughout the pipe service life. Because it is smoother than some other materials, a smaller diameter pipe can carry an equivalent volumetric flow at the same pressure. It has less drag and a lower tendency for turbulence at high flow. Size: 4-60 in. diameter. Available in a wide variety of sizes. Depending on the wall thickness of the pipe, concrete pipe can take up more space than is necessary and can interfere with existing utilities and service lines during installation raising project costs and extending timelines. Due to the variety of lengths and widths of plastic pipe, orders can be customized to specifically accommodate a job and it's needs. The lightweight and long lengths of plastic pipe allow for less heavy machinery and work crews and a shorter installation time. Because concrete is such a heavy material, heavy machinery and large work crews are needed for the installation process, thereby increasing the length of installation as well as the risk for injury. Job site functionality installation times can become extended should an issue arise during installation. With concrete, there would be a considerable increase in workloads, times and costs because modifications to the concrete structure are timely and costly. Using HDPE pipe makes it easy to make modifications right on site to fit the necessary project needs while still maintaining the integrity and strength of the structure. Jetting - Clean Out: Plastic pipe can be cleaned out very easily. Other materials that become corroded and rusted will not clean out easily as the jetting pressure blows out the rusted and corroded portions of the pipe compromising its performance. Since plastic pipe is highly inert and resistant to rust and corrosion, cleaning out the pipe will not compromise its strength and performance. Our dual wall pipe has been subjected to 1500 psi for over a 30-minute period with no deterioration of the inner wall.